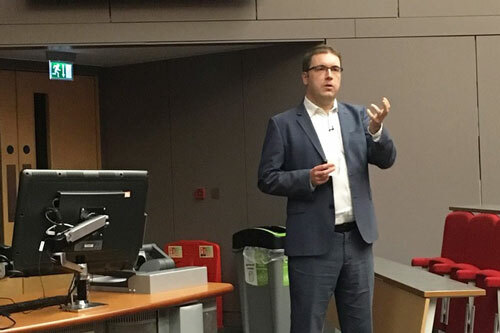 On March 27th 2018, City, University of London welcomed Dr Pearse Keane, consultant ophthalmologist at Moorfields Eye Hospital, as part of the School of Health Sciences Dean's Lecture series. Speaking about cutting edge artificial intelligence (AI) technology in ophthalmology, Dr Keane’s fascinating lecture gave an overview of how AI may help clinicians to diagnose ocular diseases at a much earlier stage than current technologies. AI is the implementation of algorithms and software to approximate human cognition in analysis of large numbers of complex medical data, such as retinal photographs or scans. Current research has shown that machines using AI have equalled dermatologists in diagnosing skin cancer and have been similarly accurate to clinicians in recognizing diabetic retinopathy (eye disease) from retinal images. Work by Dr Keane’s team has so far demonstrated that machine deep learning can estimate a person’s refractive error (spectacle prescription) from analysing that persons retinal images. Ophthalmology is the first branch of medicine to be transformed by the rapidly evolving world of AI. Eye health professionals use retinal scans in order to detect and diagnose diseases such as age related macular degeneration (AMD), which is the leading cause of blindness in the developed world. It was in 2016 that Moorfields Eye Hospital and Google DeepMind announced their new medical research partnership which hopes to revolutionise the way common eye diseases are detected and diagnosed. Using the huge amount of patient data which is collected at Moorfields every day, these anonymised eye scans will be analysed to look for early signs of eye conditions that human clinicians may miss. Interpretation of OCT scans is complex and requires specialist training, therefore AI may aid this process and provide better and faster analysis of these scans, ultimately supporting eye health professionals in the detection and diagnosis of potentially blinding diseases. Moorfields Eye Hospital in London is one of the world’s leading eye hospitals and is the oldest eye hospital in the world. Every year, over 700,000 patients attend Moorfields. This exciting collaboration involves the sharing of over 1,000,000 anonymised retinal scans with DeepMind to allow for the automated diagnosis of diseases such as age-related macular degeneration (AMD) and diabetic retinopathy (DR). Dr Keane’s research, which is set to take around five years may well be the breakthrough in earlier diagnosis of blinding conditions and has the potential to save thousands of people from preventable blindness. Dr Keane is a consultant ophthalmologist at Moorfields Eye Hospital and an NIHR clinical scientist at the Institute of Ophthalmology, University College London. He was the first ophthalmologist in the UK to receive the prestigious “Clinician Scientist” award from the National Institute of Health Research (NIHR) in January 2015.